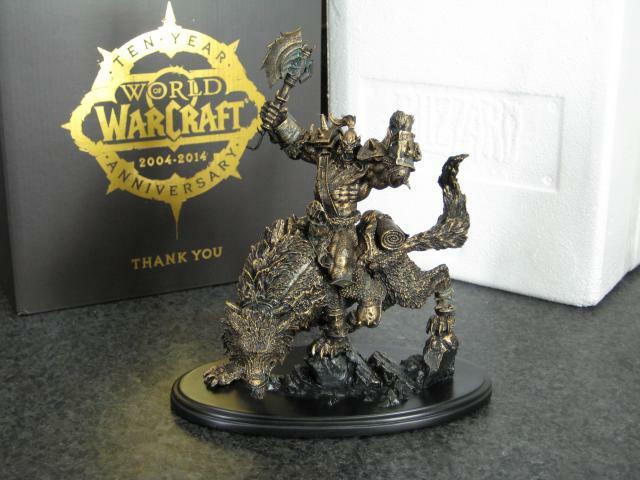 I recieved an unexpected package today from Blizzard: A mini "Orc Statue" like the one outside their headquarters. World of Warcraft has just celebrated its 10-year anniversary! It's been an incredible decade of adventures in Azeroth, and you've been with us through all of it. We'd like to thank you for your constant support these past ten years with a gift. I guess a $13/month subscription + 5 expansion packs makes this a pretty expensive "free gift"; but, nevertheless, I'll still place this guy on the desk next to my Warcraft computer. The metal statue stands about 7 inches (18 cm) tall and feels pretty hefty at 2.59 pounds (1.17 kg). The two hands are detachable and are held in by a small magnet. This statue was previously a fund-raiser for the Red Cross after the Japan disaster a few years ago.